Returned from vacation yesterday. For some reason, the GPS had us take a different route back than we took there. Going down, it had us go through Montgomery, but coming back, it decided Dothan was a better route. 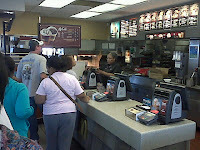 On the way back, we stopped in Weredafuqami, Florida for a snack. Drive-thru was backed up, so I went inside. I was ninth in line at the McDonald's. One register, plenty of waiting. 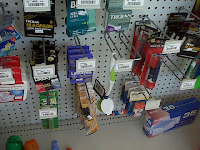 Q: What is the message when the store hangs a scrub brush next to the rubbers? A: Clean that thing before you use it. Yesterday, lots of left-wingers were asking, "Who would Jesus insure?" See what happens when people who don't believe in the Bible try to use it? Jesus wouldn't insure anyone; He would just heal them. Silly lefties. Oh, and this needs to be brought out again. Because it's as true as it's ever been. And more and more people are realizing it. Frank J said it first: "Everyone who voted for Obama is a moron. That's something that should be repeated every day." Busy today with something called an esophagogastroduodenoscopy, or EGD. Sounds like fun! Lemme know the results of your camera-down-the-throat episode. I'm still looking for the keys to my bike lock and I think that's the only place I haven't looked yet. Heh. Sorry. They didn't find anything. Well, I take that back. They found an ulcer. And I had no idea. That caught me completely off-guard. Apparently, though I didn't suffer, I'm a carrier. Lot's of people at work would agree with that.